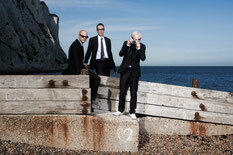 Above & Beyond recently released the official HD music video for their latest single, ‘Alchemy’. Following on from the appearance of Steven Berkoff in the last video for ‘On My Way To Heaven’ the band have cast Hollywood actress Mackenzie Firgens, the star of classic clubbing movie Groove (with John Digweed), Chris Columbus' movie version of the hit musical Rent and the brand new Butcher Brothers film, The Thompsons. The video was directed by Jonas Mayabb, a previous double winner of the prestigious Young Director Award. Featuring Zoë Johnston, ‘Alchemy’ is the latest single to be taken from the trio's second artist album ‘Group Therapy’ and is out now on Anjunabeats - including an Above & Beyond Club Mix. The band created somewhat of a Twitter storm by asking their fans to tell them how they felt about the video, retweeting many of the comments and opinions that they received. If you’ve not seen it, check it out below. magnificent publish, very informative. I'm wondering why the opposite experts of this sector do not notice this. You should continue your writing. I'm confident, you have a huge readers' base already!